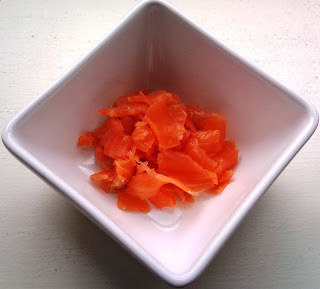 Smoked salmon is a great standby item to have in the fridge. Tasty and versatile, it's lean and if full of Omega 3 oils that are recommended to keep a wet nose and shiny coat! This recipe is one of our regular weekend lunches. Crumpets are very low in calories and saturated fat, yet it really feels like you're eating something substantial which is ideal to keep you going on a busy weekend. The following recipe makes a tasty lunchtime snack for 2 people. Pop the crumpets into the toaster or under the grill for 2-3 minutes until they are golden brown. Meanwhile, slice the salmon into small ribbons and divide into four portions. 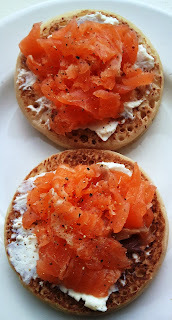 Remove the crumpets from the toaster and spread 5g (approximately 1 teaspoon) of cream cheese onto each crumpet. Pile the salmon on top and garnish with the pepper and lemon juice and chives if using.